Our national debate on immigration policy centers on a paradox. We must become aware of it and deal with it. The United States needs an immigration policy because a lot of people want to come here. If that weren’t the case, we wouldn’t need an immigration policy. Why do they want to come? For freedom. And because there is freedom, there is opportunity. The immigration issue is now a political football because of the political baggage it carries. Both parties want the votes of the Hispanic population, the most rapidly growing demographic in the country. And this is the same population most sensitive to the immigration issue because most of the illegals within our borders are from Latin American countries. And here lies the paradox. The purported strategies for “winning” Hispanic votes are not about engaging this population on preserving American freedom and opportunity, which is what makes the United States so attractive to those who want to come. The strategies are about how to pander to this population to win its votes. One of the articles, under the headline “To Reach Latinos, GOP Must Alter Its Message, Tone,” offers Republicans free advice on what they must do to get the votes of the increasingly powerful Hispanic demographic. If Republicans are going to continue to “howl at the moon about the evils of “big government”,” this column advises, they can kiss these Latino folks goodbye. America was built by hundreds of millions of immigrants coming here to be free. Yet we are now told that this latest group of immigrants, Hispanics, must be offered more government, less freedom. True, Barack Obama succeeded with Hispanic voters where John McCain and Mitt Romney did not. But it is also true that over the last 6 years government and national debt has exploded and our economic growth is now larded and stunted. Latest projections from the Congressional Budget Office predict growth rates of our economy to be two thirds of what it has averaged for the last half century. Let’s recall that even the demographic category “Hispanic” is a purely political construction, devoid of any racial or ethnic reality, designed only for special interest lobbying. Immigrants from over 20 countries fall under the heading “Hispanic.” What exactly is it that people from Mexico, Puerto Rico, Spain, Cuba and Argentina have in common, other than the Spanish language? 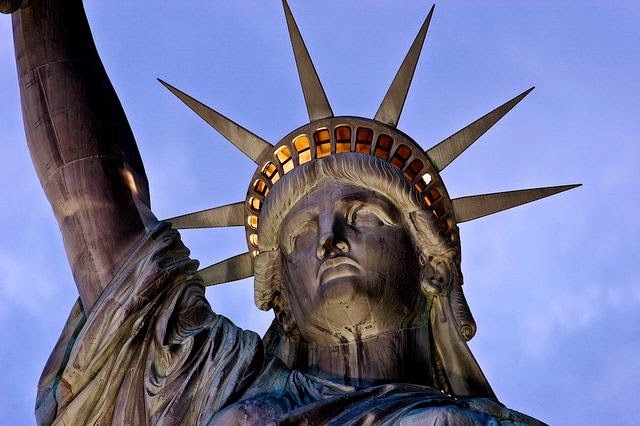 It is the history of America that immigrants have come from around the world for the privilege of living free. All share a history of struggle, often discrimination at first for being different, but overcoming it all to become an American. Native Americans and African Americans are the only groups that have different and unique histories. But those from Latin American countries are no different from all other American immigrants who came by choice for what this nation has to offer. The best thing that Republicans can do for Hispanics, and for every American citizen, is to stand guard on America as a free country and land of opportunity. The worse thing they can do is to pander to the welfare state left and put America’s most precious commodity, freedom, on the auction block to bid for Hispanic votes.